Osa Major's location offers expansive countryside views (photo: Tessa Jol). 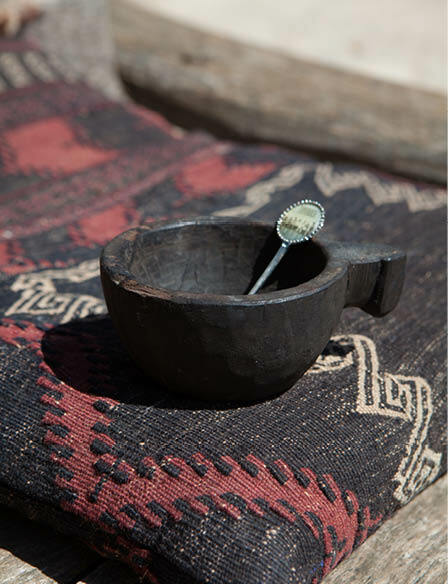 Objects sourced from travels adorn the home (photo: Tessa Jol). Osa Major sits atop a mountain (photo: Tessa Jol). 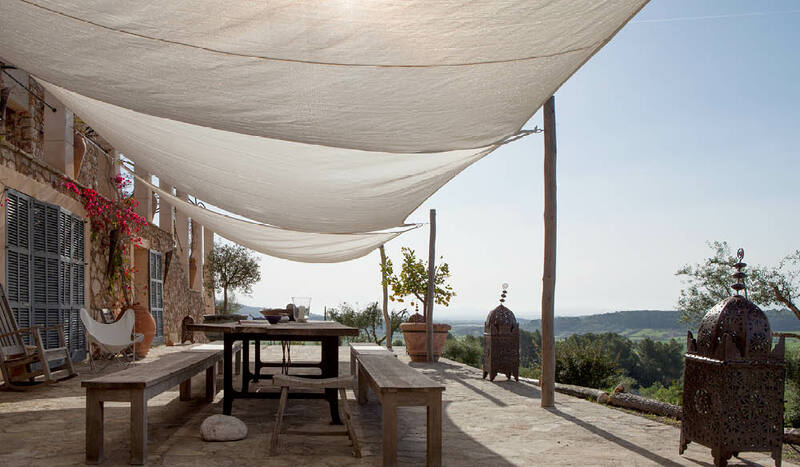 Osa Major: A peaceful place to sleep in the Mallorca countryside (photo: Tessa Jol). 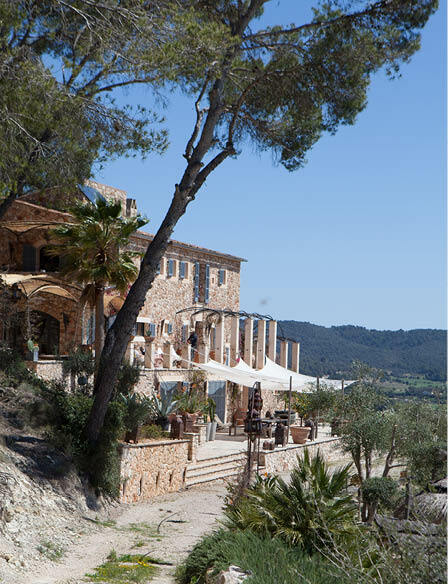 Tuscany comes to the Balearic Islands: Osa Major, Mallorca (photo: Tessa Jol). 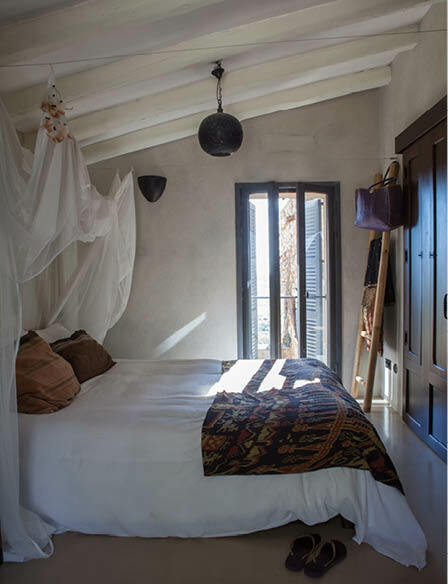 A rustic finca on the sun-bleached Spanish island of Majorca offers a retreat for the body as well as the soul, writes Tessa Jol. After many holidays spent sailing around Spain’s idyllic Balearic Islands, an archipelago of four main islands off the country’s east coast, Brenda Ooteman and her husband Roland Verbeek decided to do a deeper dive into the destination, setting off to explore the main island of Majorca by motorcycle. The couple felt instantly connected to the breathtaking nature and picturesque villages they passed through on their travels. And then, in the heart of the island, they found their own piece of paradise on top of a mountain. They had to have it. 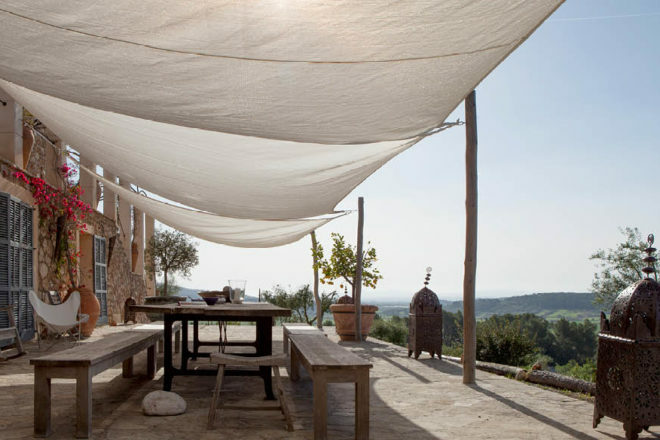 After securing the land, Brenda and Roland set about establishing a finca (rural property) here that would allow them to make the most of the laconic pace of life on Majorca, and the stunning surrounds. 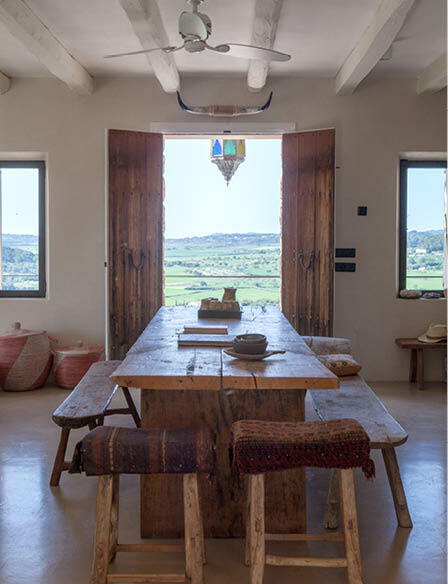 But the project took time to realise; the couple could not start building for three years after a previously planned build by a German architect unearthed items and remains of historical significance. The land sits at the foot of what is believed to have been a holy mountain where the first inhabitants of Majorca built their settlements. Pieces discovered during archaeological investigation seemed to confirm that this particular mountain was used for medicinal rituals by traditional healers. Now complete, the house, called Osa Major (meaning ‘great bear’, after the constellation as well as the animal’s Native American symbolism of power, wisdom, freedom and motherhood) boasts phenomenal views and an infinity pool. Here, Brenda welcomes and cares for her guests, offering a place to heal body and spirit. She serves vegetarian food and detox shakes, offers massages, meditation and adventurous hikes, and teaches yoga. “During my travels to Asia – especially to India, Pakistan and Sri Lanka – I discovered the Eastern philosophies of Hinduism and Buddhism and I felt like my spirit was coming home,” explains Brenda. Situated near Montuïri and Santa Maria del Camí in the heart of Majorca, the area is referred to as the Tuscany of Majorca. It is a perfect comparison given its unspoilt natural surroundings, but the hip and happening atmosphere of the island also begs comparison with the likes of Ibiza as well, albeit a bit more peaceful. Osa Major, which was completed in 2011, possesses a bohemian soul that allows it to sit harmoniously within the rugged landscape and the laid-back culture of the island. But in spite of all of this, the island got into their blood. For a while the couple flew between the island, their home in the Netherlands and a rental in Venice Beach in LA, where Roland’s company, Spinn Coffee, is based. But ultimately they felt drawn to Majorca as their home base. And then the guests started to arrive. “We didn’t plan to make Osa Major into a guest retreat, but our friends and family visited this magic place so often that the concept naturally evolved,” according to Brenda. The interiors of the house lend it a considered, rustic feel, mixing a barefoot luxe vibe with eclectic influences and objects, many inspired by, and brought home from, Brenda and Roland’s extensive travels. Guests can stay in the Aboriginal room, which is decorated with images by the celebrated British photojournalist Jimmy Nelson, a friend of the couple’s, whose portraits of tribes and indigenous peoples around the world are truly breathtaking. There’s also cosy teepees and recently, Brenda added a yurt perched on a mountain to the Osa Major room roster. And there are always new plans on how to become that little bit more self-sufficient. “This year, I’d like to build my own produce and herb garden, and orchard with mangoes, kiwis and lemons,” Brenda explains. If she approaches this project with the zest and determination she has put into every aspect of Osa Major, it is a given that it will happen. Getting there: Vueling Airlines has daily flights from Barcelona to Palma; flying time is 50 minutes. Osa Major is a half hour’s drive from Palma de Majorca Airport. Staying there: Osa Major offers guests retreat-based stays concentrating on yoga, good food and lots of sunshine, or it can be exclusively booked.